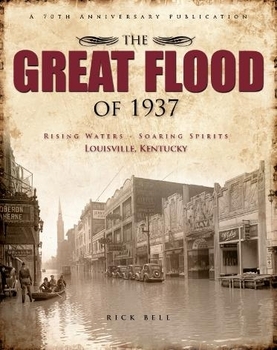 "Like San Francisco's earthquake and Baltimore's fire, the flood of 1937 became a Louisville benchmark; modern Louisville started with it." So said Harper's Weekly, and most historians agree. Seventy years ago, in January 1937, the Ohio River flooded in biblical proportions. Like New Orleans after Katrina, two-thirds of the city of Louisville, Kentucky was under water. But the citizens of Louisville, under the inspired leadership of Mayor Neville Miller, fought through the hardships and the challenges of the city's worst natural disaster to overcome extraordinary tragedy to save their city. This is the complete story of those heroic days. Through historic photographs, maps, log books, diaries and personal recollections, author Rick Bell re-creates, in thrilling detail, the magnitude of the devastation and the totality of the city's eventual triumph. Rick Bell is a native of the Portland neighborhood of Louisville, Kentucky — one of the areas inundated during the Great Flood of 1937. He grew up hearing stories of the Flood and of the indomitable spirit of Louisville's citizens during that crisis. He has spent years collecting the stories and photographs — many previously unpublished — that are featured in this book. Bell serves as the Executive Director of the U.S. Marine Hospital Foundation in Louisville, and currently resides in its Crescent Hill neighborhood.